SAN YSIDRO – Luis Ramos, a lifelong community member, has officially been named principal of La Mirada Elementary School after serving in an interim capacity over the last year. Ramos joined the San Ysidro School District in 2005 as a sixth-grade teacher at La Mirada, going on to teach eighth grade at San Ysidro Middle School (SYMS) and serving as assistant principal at SYMS before becoming assistant principal at La Mirada. He began his role as interim principal at La Mirada in 2016-17 after then Principal Manuela Colom was named the District’s executive director of curriculum, innovation and instruction. Ramos was raised in the South Bay and graduated from San Diego State University with a degree in education. “Mr. Ramos truly believes in the capabilities of his students and works hard to ensure each child is provided a quality education every day. He did a wonderful job taking care of the needs of students and staff at La Mirada last year and I know that he will continue building upon those successes in 2017-18,” Superintendent Dr. Julio Fonseca said. 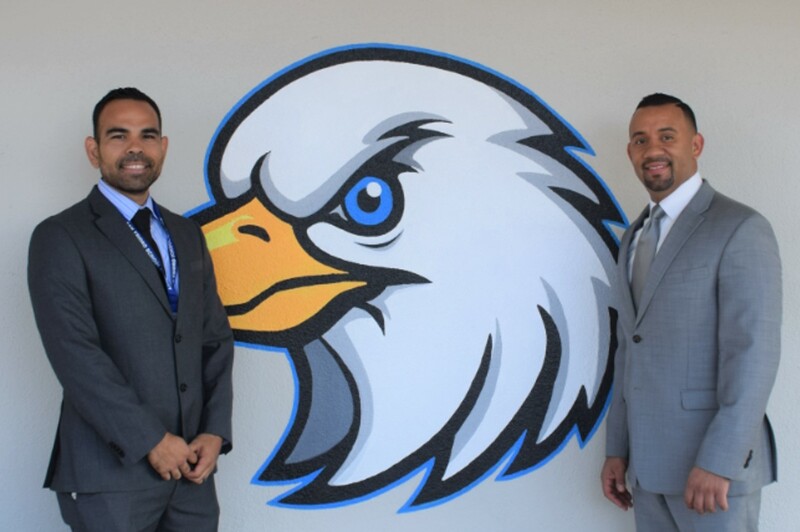 La Mirada Elementary's new principal, Luis Ramos, and San Ysidro School District Superintendent Dr. Julio Fonseca.